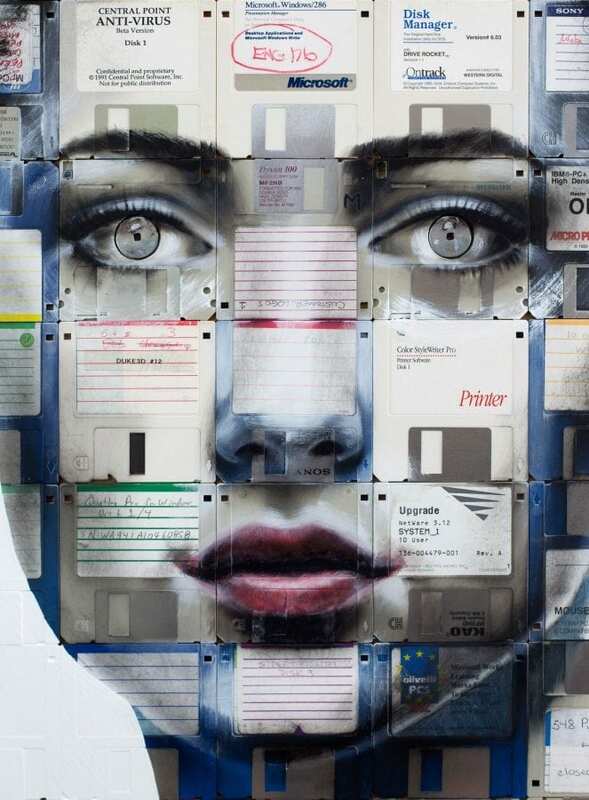 An artist is bringing obsolete floppy disks and videotapes into the 21st Century – by transforming them into shimmering portraits. Nicholas Gentry encourages people on social media to send him their old tech which he turns into artwork, filled with personal memories from across the globe. 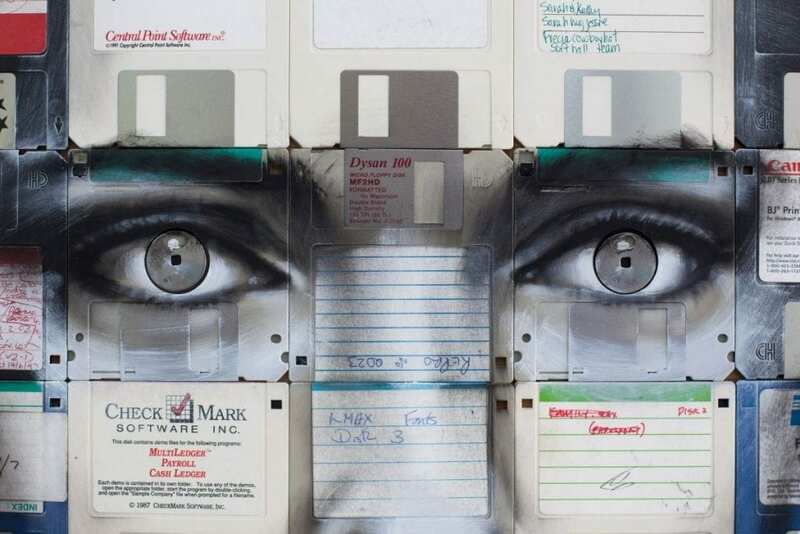 The 38-year-old uses the outdated storage devices to express the feeling of time passing through his portraits displayed at the Human Connection exhibition at London’s Opera Gallery. Nick, of Walthamstow, north east London, said: “Art is good at capturing the moment and how time changes that. “These objects are the same as they were 20 years ago but it is us who have changed and how we see them. “I get these packages from all over the world with handwritten messages of why people have sent their disks and tapes in. 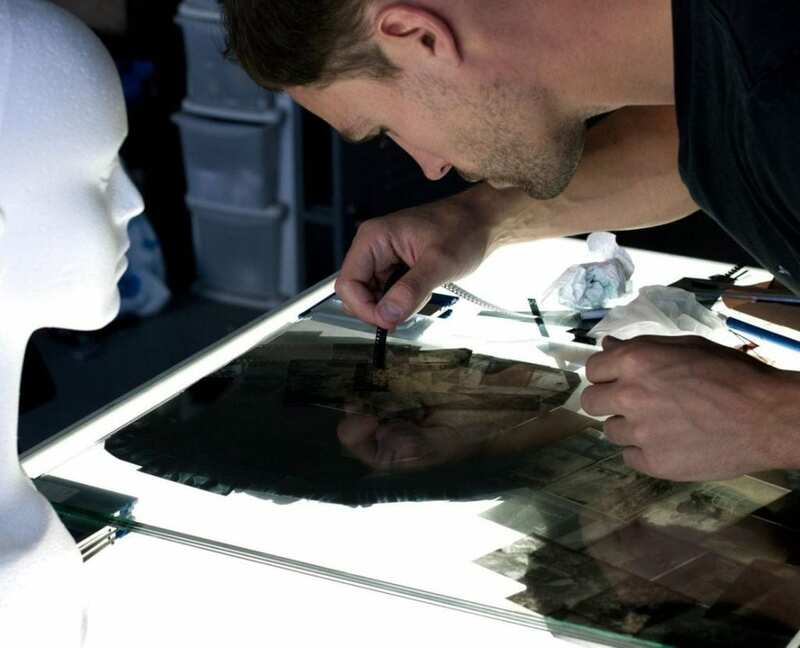 Nick uses 100 disks per portrait for an average sized piece, measuring 2m x 1m. Made from crushed compact disks, videotapes, fragmented CDs and old bits of film, his artwork preserves personal pieces of history from all over the world and raises questions about humans’ relationship with technology. Nick said: “I think what we are doing is merging with tech now. 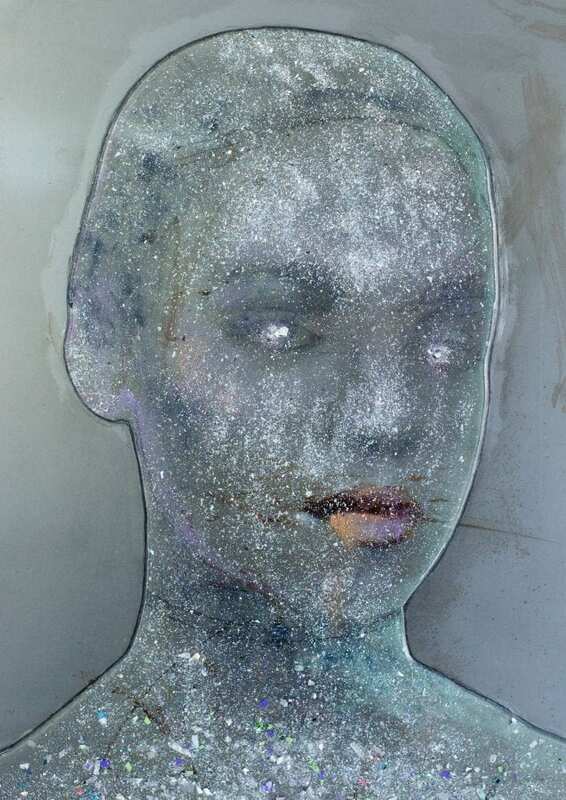 “We are entering that world with artificial intelligence where we are making human-like forms. “We have our organic memories as human beings, which can change after the moment. “But machines have a way of recording the information exactly. The eighties child was inspired by his childhood memories of the floppy disk and its prevalence at that time as the primary storage device. He said: “I grew up using these things. Nick, who studied graphic art at University, separates the devices according to colour into a mosaic-like arrangement. 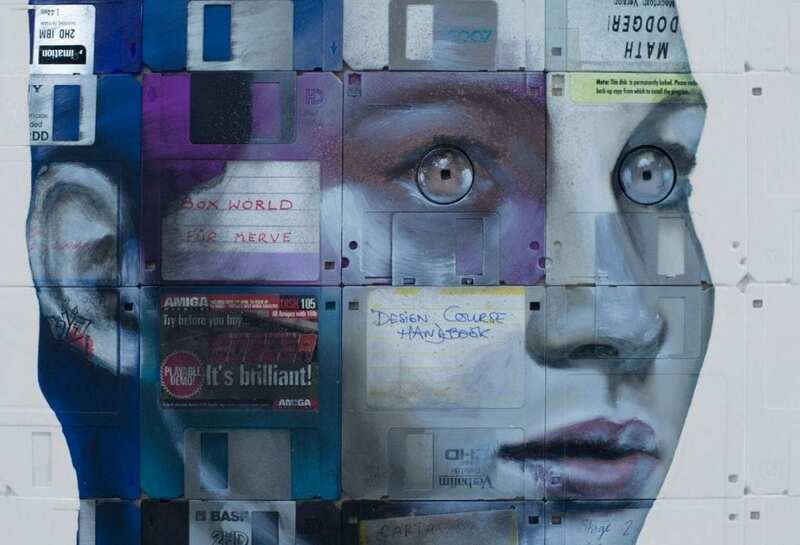 He then strips the floppy disks of any metal and removes the aluminium from the CDS, converting them into ‘data flakes’ with the average portrait using 100 disks. 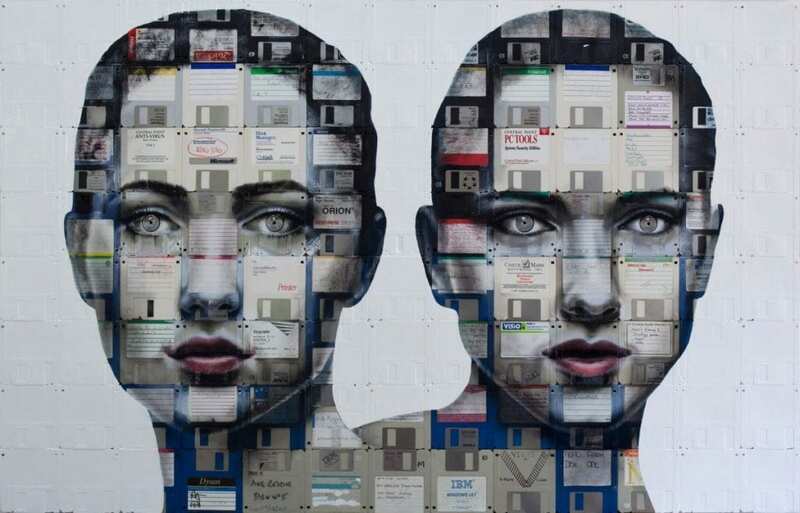 The flakes are mixed with a clear resign and an adhesive is applied to the floppy disks to piece the portraits together. 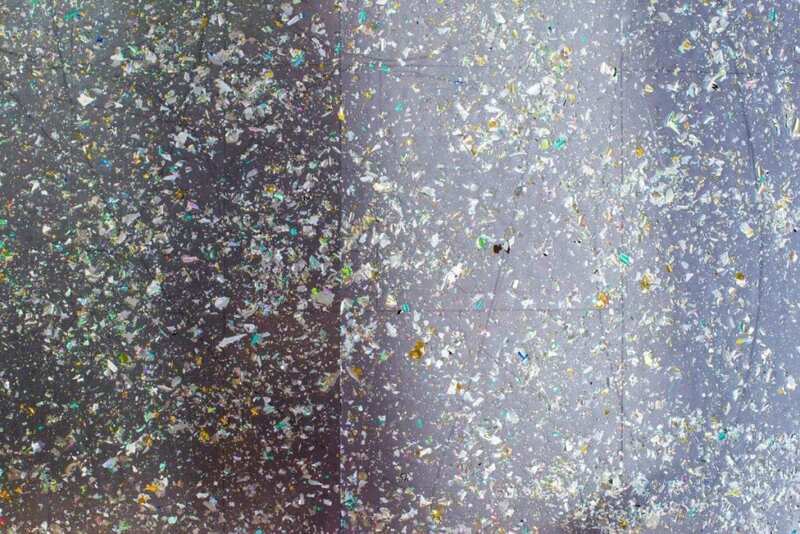 He said: “I crush up all those flakes of data into a fine glitter dust that contains information from thousands or millions of people which is quite amazing. “The materials are central to it, I let them take the central stage. The artist photographs his subjects at his home garden studio on which he bases the portraits. 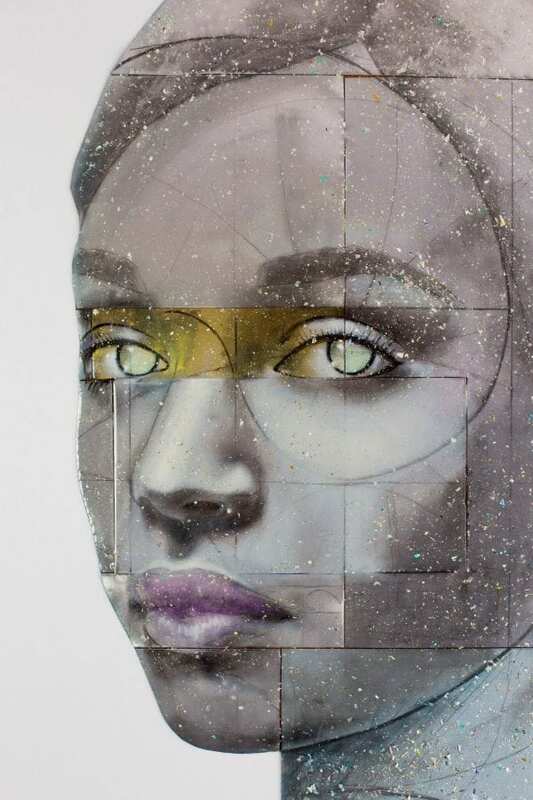 He tries to avoid identifying age, gender and race and said his portraits are ‘like a void to be filled’ which enable people to bring their own identities to his work. Nick said: “I love faces, I have always loved drawing them and painting them. “But the faces I create are not recognisable on purpose. “It is not about any person in particular. The machine-like element to his work is achieved by using harsher lighting conditions when photographing his subjects. He said: “The light I use is quite unforgiving. “It can bring out the masculine side of women. “I like making the female form look quite strong and angular, which brings the machine like element to my work. “In fashion, you have the whole idea of ideal beauty. “Women are always treated like these objects to look at. “I am playing with that and asking why that is. The artwork will be displayed alongside Korean-based international artist Seo Young-Deok who welds chains into giant sculptures of the naked human body. Nick said: “The gallery must have known we had something in common, this shared energy, even though we are on opposite sides of the world. It has been brilliant. 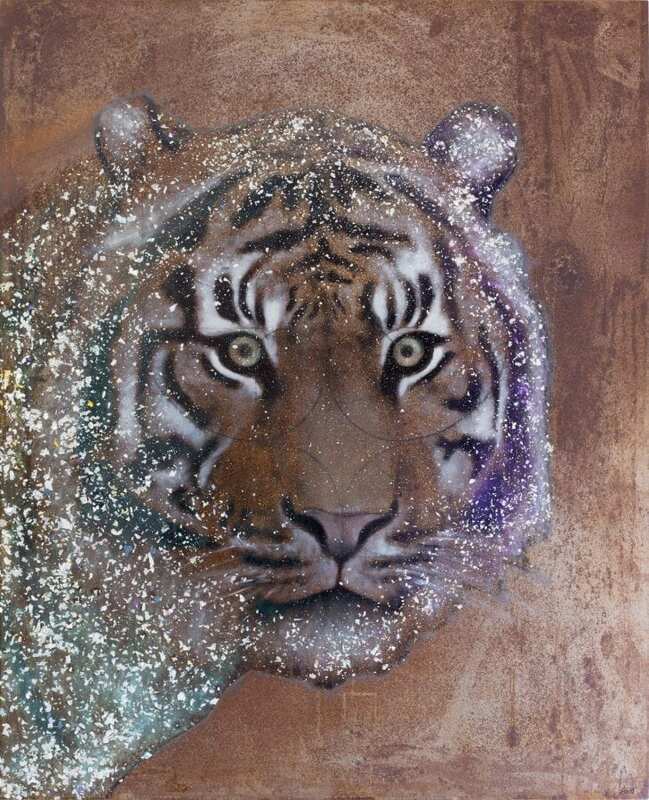 The artist also encourages people to reuse and reduce waste through his art and is working with UK charity Tusk in The Tusk Rhino Trail to celebrate the magnificent species and draw attention to poaching threats. His sculpture is customised with data dust from 500 CDs and was one of 21 embellished rhinos displayed at iconic London sites to mark World Rhino Day.